Walking to the old Farmers’ Market on Fairfax and Third last week, Neal and I spied some rhubarb growing in a neighbor’s yard. The plant had already gone to flower, so it wasn’t going to be good eating, even if it wasn’t an integral part of their landscaping. But it got me thinking of the pint of strawberries in my fridge and one of my favorite, simple French desserts: clafoutis. I love clafoutis, which is essentially fruit and cake batter, but it tastes a cross between custard and a pancake-y Dutch baby. In Limousin, where the dessert originated, it’s usually made with early-Season cherries, pits and all. The little stones inside aren’t edible, but as they cook they add depth of flavor to the clafoutis. When I make the dessert with cherries, I like to pit them, but rather than cutting the cherries up, I prefer to split them by hand to remove the pit but keep them mostly in tact. It adds to the rustic appeal of the dish. Moreover, I love clafoutis because it’s so hard to mess up. Even the worst clafoutis tastes pretty good, and it takes hardly any time to make. So I picked up some crimson stalks of rhubarb at the market to make a strawberry-rhubarb clafoutis. 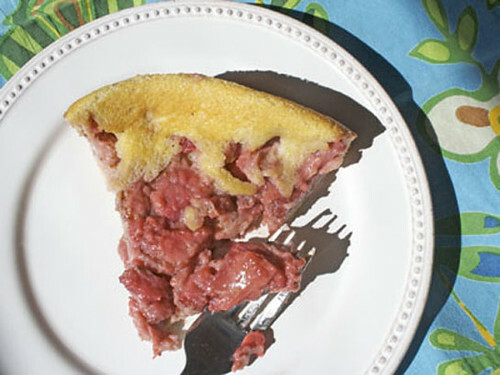 I found a recipe from the folks at King Arthur flour that I used as a foundation and set to hulling and halving strawberries and dicing rhubarb. And while the final version made for some good after-dinner treats (and late-afternoon, passing-through-the-kitchen will-power busters), this not-to-sweet version, which I spiked with cardamom and black pepper, was a delight first thing in the morning with my cup of coffee. Heat the oven to 350 degrees. Grease a 9-inch cake pan or casserole dish. In a sauté pan, melt the mutter. Add the rhubarb and place the strawberries on top, cooking for about five minutes and giving an occasional shake to make sure it’s not sticking. (The goal is the reduce the fruits’ juices to create a bit of a syrup without turning the strawberries to mush.) Sprinkle the 1/3-cup of sugar over the berries, stir and bring the mixture to a boil. Cook for a few minutes, until the mixture thickens slightly. Pour the fruit into you baking dish and let cook while you make the batter. In a medium-sized bow, whisk the sugar, salt and eggs together until it is light. Slowly add the flour, whisking until combined. Stir in cream, vanilla, cardamom and pepper. Pour the batter over the fruit. Bake for 35-45 minutes, until the cake is puffy and browned on top. Dust with powdered sugar or serve with whip cream or ice cream. I had Leah’s recent Cherry Clafoutis and nibbled every last morsel from the plate. Now that I know it’s that easy to make, I’ll make up a batch at home! OMG, I love clafoutis too. I had the most AMAZING cherry clafoutis the other day and it was tough to try not to ask for the last remaining piece in the dish. I loved the fresh fruit in this dish and it was so well balanced with the custardy/pancake-y base. Thanks for the dish Leah! This sounds great–I love clafoutis too and it’s nice to have something new to do with strawberries & rhubarb. Nice post. And why not a clafouti for breakfast?! Eggs, fruit, flour, and less sugar than your average muffin … Thanks for the great spring post. I just tried this recipe today, minus the cardamom and vanilla as I was out, plus a little cinnamon to compensate. It turned out delicious, thanks for the idea! LOVE clafouti. One of my all time fav’s.. elegant and draw dropping good. Your comment about coming home from the farmer’s market with more than you can possibly use is a problem I often have. I am spending the winter months on the North Shore of Hawaii with my daughter and visit the local Sunday Market every week. I buy all my veggies and fruits there plus grass fed beef, range chickens, homemade butter and etc. What fun! I always bring home more than I can possibly use but the entertainment of the market is worth it.